Recipes by Fog City Press and Tanya Zouev. Photography and styling by Tanya Zouev. I found this little square cookbook, The Quick & Easy Cookbook, on the street on which I live along with the Cajun & Creole Cookbook I wrote a post on a few months ago. I did think about sending this book straight on its way to a charity shop but curiosity got the better of me, especially when I saw the “quick and easy” chocolate terrine in the back (yes, I’m a sucker for chocolate). The book was published by Fog City Press in 2002 and is an Australian edition of an original US publication with no actual author having been credited with writing the recipes. The only name I recognised in the credits was Christine Sheppard, who is now the food editor of Woolworths Fresh Magazine, whom I did some work for years ago. Christine was the home economist (cook) on this book shoot. The book is predominantly text with only a small scattering of colour photographs. I decided to cook two recipes, a main course and a dessert and I added a really quick and easy (excuse the pun) one of my own to compliment the first recipe, Fish Fillets With Lemon & Coriander Seed. It presented itself as a steamed fish dish, which sounded very appealing with its combination of red capsicum, ground coriander and lemon flavours. I wasn’t sure why the name didn’t mention the main ingredient of red capsicum but did mention one of the lesser ones, especially considering the flavour of red capsicums is such a dominant one. The original recipe calls for pouring the red capsicum puree over the steamed fish just before serving. I decided instead to bake the fish and puree together, it turned out delicious. Please note that the ingredients in the original recipe listed already-roasted red capsicums, probably assuming the cook was using the shop-bought variety. I have included instructions for how to roast capsicums in the following recipe however if you wish to use store bought ones then feel free to do so. Serves 6. Prep time 20 mins, cooking time approximately 20 mins. 1. Heat oven to 200˚C (approx. 400˚F). Cut the capsicum into quarters, removing the membrane and seeds. Place onto a baking tray skin side up and roast until the skin has blackened. Immediately place the roast capsicum into a bowl and cover with a plate making sure it’s a tight fit. (I use a plastic bowl and plate for this as I won’t use plastic bags for environmental reasons.) Once cooled the skins will peel off the capsicum pieces. 2. Place the capsicum, garlic, olive oil, coriander seeds, lemon juice, water, salt and ground pepper into the bowl of a food processor (I used a small Braun hand blender like this one and it worked really well). Process until smooth. 3. Season the fish fillets with salt and white pepper and place in an oiled baking dish. 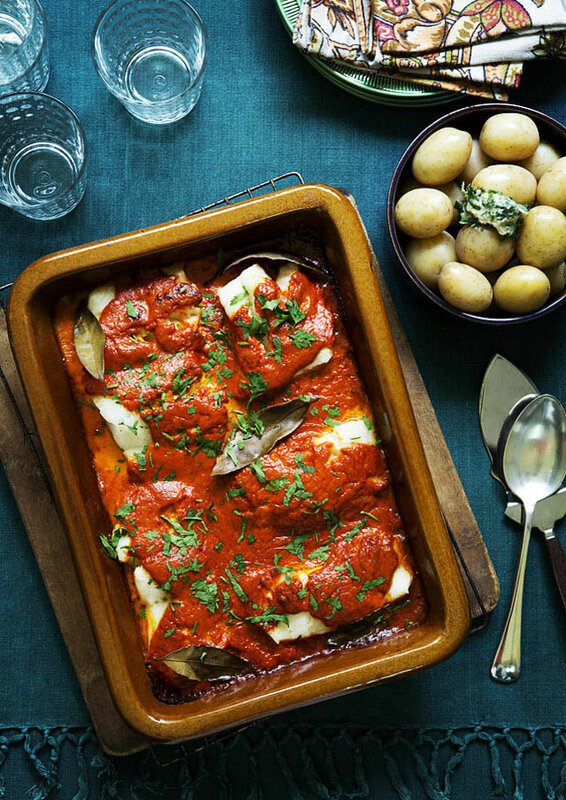 Pour the capsicum puree over the fish, scatter the bay leaves and place in the oven for approximately 20 minutes at 200˚C (approx 400˚F). 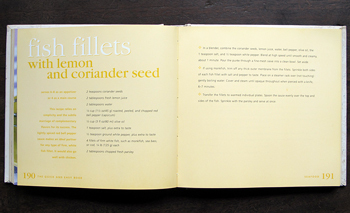 Test fish is ready by inserting the point of a knife into the centre of a fillet. If the fish is white and flaky it is ready. If not, place back in the oven for another few minutes. 4. Sprinkle the chopped parsley over the fish and serve at once. 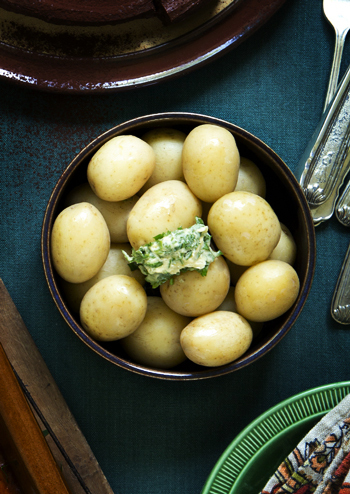 Goes very well with my Steamed Baby Potatoes with Parsley Garlic Butter, recipe below. These are simple little spuds which revel in their own sweetness and team up beautifully with a salted garlicky herbed butter. 1. Steam the baby potatoes until they are soft (test they are cooked through by inserting the point of a knife into one). 2. Place in a bowl the butter, olive oil, parsley, garlic and salt and mix with a fork until combined. Spoon over potatoes and mix through so all the potatoes are coated. Any combination of dark chocolate and raspberries stokes my fire so I was very excited to make this. One of my most favourite sensations in the entire known universe is dark chocolate melting in my mouth in unison with tangy raspberries. The overall recipe was pretty good however there was a slight problem in the method, presumably an issue with converting the original American recipe into an Australian one. The original recipe calls for American heavy cream and states that double cream as we know it here in Australia, is the same. Food fact: it isn’t the same, as double cream has a higher fat content of around 50% and won’t whip, heavy cream has around 38%. The original recipe states that you need to whip the heavy cream until stiff peaks form but if you try to whip double cream it will turn to butter very quickly. I used double cream but I only lightly whisked it to aerate it a little. With the required amendments the following recipe is in short, amaaaazingly good. This is the sort of dessert I used to pay a fortune for in good restaurants except now I know how to make it at home. (If anyone knows the restaurant Blue Ginger in Sydney’s Balmain, they have a similar dessert on their menu called the Dark Belgian Chocolate Truffle and it’s about twelve bucks for a tiny serve.) 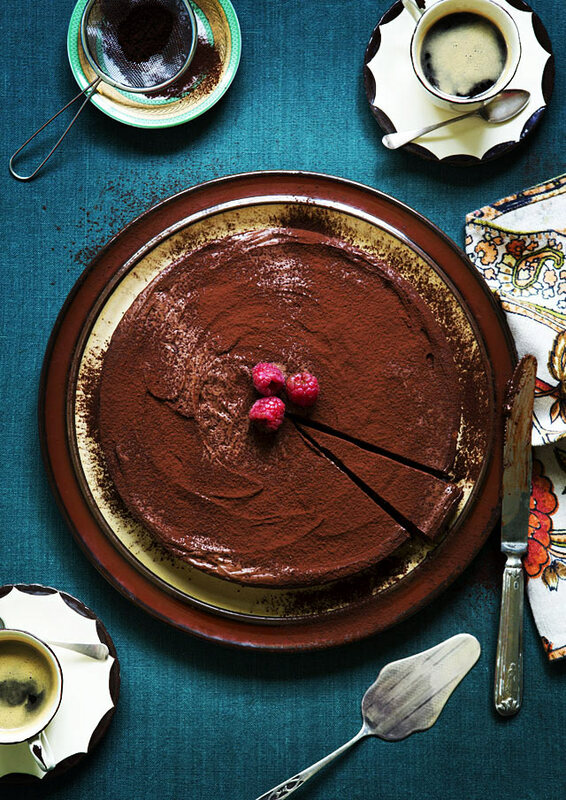 If you’re having a dinner party this dessert is a must. It will knock any chocolate lover’s socks off. It’s only downfall is that it is in absolutely no way quick and easy because you can’t eat it until 12-24 hours later! Serves 12. Prep time approximately 30 minutes, cooking time approximately 20 minutes then 12-14 hours setting time in refrigerator. 1. 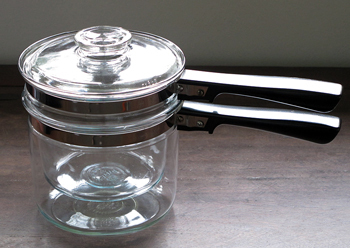 Melt the chocolate in the top of a double boiler (I use a vintage Pyrex one picked up at the Salvo’s for eight bucks, see picture below). Add the butter and stir until smooth. 3. Whisk the cream very lightly, as double cream will turn into butter very quickly, just enough to whip it up a little. Add the vanilla extract, fold it into the chocolate batter. 4. Line a 28cm (11”) cake tin with non-stick baking paper (I used this Anolon springform tin) and pour in the batter. Cover and refrigerate for 12-24 hours. 5. Keep the terrine refrigerated until just before serving. Sprinkle the cocoa powder with a small sieve over the terrine just before slicing into individual wedges and serve with fresh raspberries. 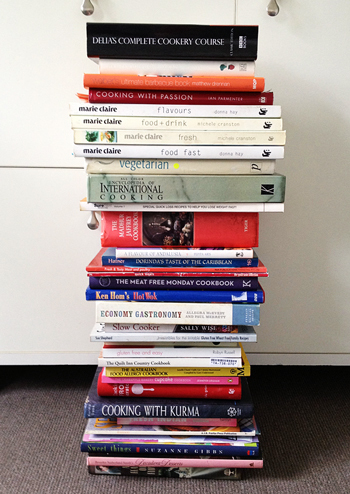 The book however has recipes which do sound appealing so it may provide inspiration, for the reader, as it did for me. I will definitely make both the fish and chocolate terrine again, however I will be using my adapted recipes rather than the originals. 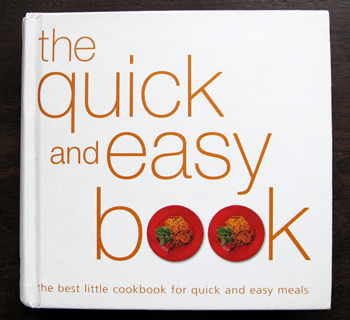 I’m not saying that the book is bad, I just don’t think many of the recipes fit into the “quick and easy” category the book claims them to be. I will flip through the book once again and copy a few more recipes into my iPad to try out but I won’t be keeping the book. I’m sure however it won’t last long on the shelf at Vinnie’s*. The inspiration for this shoot is the concept that even though a piece of kitchenware isn’t modern or new, it still performs its original intended function. I find so many wonderful pieces of kitchen and homeware in the trash on my hard rubbish treasure hunts and it saddens me. I often think about photographers for magazines such as Saveur who go into kitchens all over the world and take pictures of people who have very little, and the incredible food they cook. These people don’t have access to the latest celebrity chef tableware collections, yet treat what they own with respect and care. In Australia we have such a disposable view on consumerist goods and it’s sad to see a serving platter or dinner plate which would be used until it broke in a home in Cuba, Russia or Africa, tossed out in a council clean-cup because its original owner is tired of it or it no longer conforms to the latest homeware fashion trends. I went for intentional mismatching with these images, as though I was visiting one of these homes and the host used whatever they had, nothing really matched but the food was prepared with love. The idea is that the food still tastes the same whether or not the kitchenware was used is the latest designer range or an assortment of used hand-me-down items from Vinnie’s or family. The background cloth surface was an old stained green tablecloth found at a charity shop which I soaked and brought back to life. The chunky Spanish baking dish for the fish, the bowl for the potatoes and vintage cutting board are all from our local Goodwill. The vintage espresso cups and saucers, green plates, cake lifter and knife are from Salvo’s. The vintage brown stoneware plate, glasses, napkins, green bordered plate, spoons and sieve are all found objects from hard rubbish council clean-ups. * For any readers who live in Sydney and love op-shopping, Vinnie’s Brookvale has a huge shelf loaded to the gills with cookbooks which change regularly. If you enjoy second hand books this particular charity shop is great because it’s a sorting depot and the stock changes very quickly. From Keith Floyd to Jamie Oliver, prices are usually 50c to $3. The address is 638 Pittwater Road Brookvale NSW 2100. I decided to give this recipe a go for dinner, last night. What a fantastic and simple recipe! Ive never roasted capsicums before but found it to be really easy and the sauce was so flavoursome and definitely worth the effort! Tried this last night. It was wonderful!